For over a century, Trinidad and Tobago (T&T) has been involved in the Exploration and Production (E&P) of petroleum resources. In 1993, the Government of the Republic of Trinidad and Tobago (GORTT) established Petrotrin charged with the consolidation and operations of petroleum production, refinement and asset marketing of the previous state-run enterprises (Petrotrin, 2012). In addition to the success of its oil endeavours, T&T has also been prosperous in its gas initiatives, promoting the industrialization of gas in 1953 and incorporating the National Gas Company of Trinidad and Tobago Limited (NGC) in 1975. During the 1900â€™s, T&T utilized E&P Licenses for international investment activity in the petroleum sector. The GORTT, subsequently established the Petroleum Act and Petroleum Regulations 62.01 (1969) (Petroleum Act) to govern the activities of industry. Due to the rapid increase of oil production and the improvements to the administrative functions, T&T issued its first Production Sharing Contract (PSC) in 1974. In 2004, the GORTT implemented the Local Content and Local Participation Policy and Framework for the Energy Sector of Trinidad and Tobago (LCP). The aim of the policy is to improve sustainable development in T&T by ensuring that the citizens of the country are equipped and able to participate in the sector responsible for over 40% of annual Gross Domestic Product (GDP) and 80% of exports. Currently, the sector employs just over 5% of the labour force (Ministry of Finance and the Economy, 2013). This paper examines the effect of the LCP on the terms and conditions within PSCs issued to International Oil Companies (IOC) in T&T for the development of petroleum resources. Chapter 2 contains a brief overview of the different types of contracts and the history of investor state relations in T&T. The LCP is evaluated in Chapter 3 along with a comparison of terms in the PSC that have been affected due to the implementation of the policy and its impact on the country. Chapter 4 provides an assessment of the outlook for T&Tâ€™s investor relations and determines if there should be a change in the main contract type to facilitate the LCP. To reap the benefits of the petroleum sector resource rich nations often rely on international companies to conduct E&P activities as they are more experienced and have access to more capital funding. They have developed a symbiotic relationship, as host countries and IOCs depend on each other to obtain income. 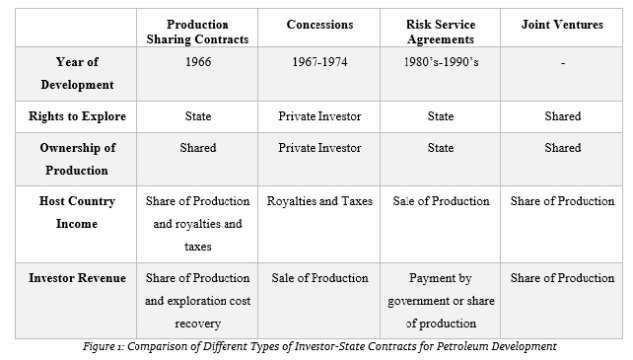 The negative consequences of allowing foreign companies to develop local resources, such as exploitation and pollution, have led to the development of contracts to govern the relationship (Katz, 1992). There are four main types of contracts currently in use today. These are the PSCs, concessions, risk service agreements and joint ventures. An overview of these contracts is presented in Figure 1. Exploration (Public Petroleum Rights) Licence - grants the licensee the non-exclusive right to carry out the petroleum operations provided by the licence. Exploration and Production (Public Petroleum Rights) Licence - grants the licensee the exclusive right to explore for, produce and dispose of petroleum in accordance with the terms of the licence. PSC - conduct of petroleum operations relating to the operations relating to the exploration, production and disposition of petroleum within a prescribed area. According to the Petroleum Act, the award of a PSC in T&T involves a bidding process which requires, the payment of a pre-bid application fee and a full examination of the most recent model PSC. Bidders are also obligated to make an oral presentation demonstrating their technical and operational competence. The successful bidder is awarded a PSC based on the model examined. Where a discovery is not achieved within nine years of being awarded the contract, it will automatically be terminated. If, on the other hand, a discovery is made, the contract will be extended for a minimum of thirty years. The LCP aims to promote sustainability by utilizing the capabilities of international companies to build local businesses, people, technology and capital markets (GORTT, 2004) via fiscal and non-fiscal methods. The traditional concept of â€œgiving preferenceâ€ to local suppliers based on internationally comparable cost, quality and timeliness of delivery has not improved T&Tâ€™s stance as only a globally competitive firm succeeds (GORTT, 2004) . Therefore, the LCP aims to promote local ownership, control and decision making, as well as local preferential project financing. This is in addition to the adequate and appropriate training of the local labour force to prevent IOCs from employing foreign personnel where the local market is able to satisfy the requirements. The policy also aims to take advantage of the countryâ€™s small population of approximately 1.3 million people (Central Bank of Trinidad and Tobago, 2012) and create a diverse and well trained labour force. This policy requires IOCs to give preferential treatment to local suppliers and enterprises by guaranteeing that they are given assertions from the principal operator which relate to access, treatment and re-imbursement for goods and services actually provided. The IOC is also required to address barriers that are currently preventing this from happening. Due to the implementation of the LCP, the MEEA has updated the terms and conditions of the PSC to better reflect the objectives of the GORTT. Figure 2 provides a synopsis of the terms and conditions in both the 2000 (MEEA, 2000) and the 2012 (MEEA, 2012) model contract for Deep Water Blocks off the coast of Trinidad with regard to local content. 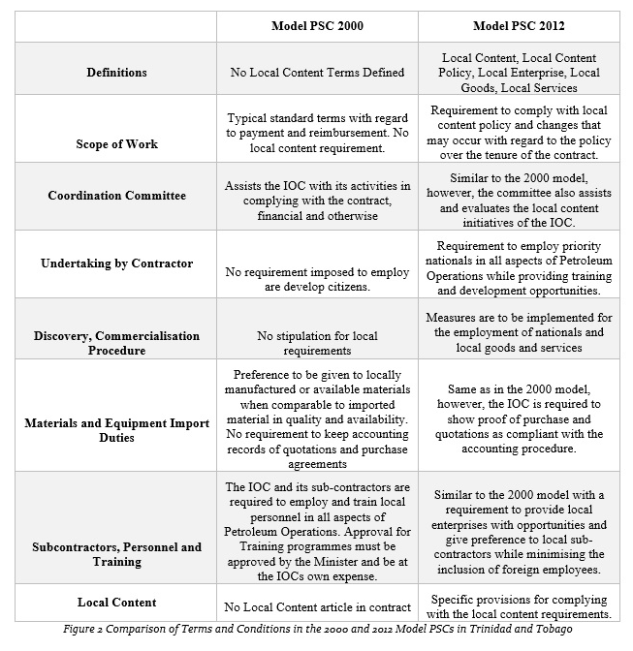 Based on the comparison of the terms and conditions in the model PSCs (Figure 2), it is clear that since the policy implementation, there have been positive changes affect the local landscape. The 2000 Model failed to adequately provide for local development mentioning local content requirements 75% less than the 2012 Model. The shift into a more stringent and detailed PSC with regard to local content, holds the IOC and by extension the energy sector responsible for the development of the local labour force. It acts as a mechanism by which the GORTT protects its citizens from the adverse repercussions of FDI and reduces the instances of repatriation of funds (Global Business Reports, 2012). Figure 3 shows a comparison of the labour force contribution to the energy sector in 2000 and 2012. 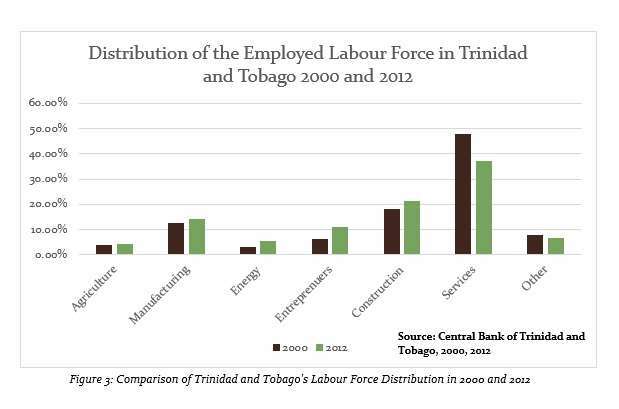 In 2012 the energy sector represented 5.4% of the total labour force in T&T increasing from 3.3% in 2000. The graph therefore insinuates that since the adoption of the LCP and the new terms and conditions in the PSC, more local labour has been geared towards the energy service sector for upstream, midstream and downstream activities. The 2012 Model not only helps the local labour force through employment and training and development opportunities, but also helps nurture the entrepreneurial spirit by allowing small business owners to participate and reap the benefits of the countryâ€™s largest sector. The provisions in the 2012 Model also attempt to reduce the imports and promote local manufacturing to control the trade balance and improve the current and capital accounts of the country. Despite the introduction of the policy and the changes to the new PSCs, several IOCs are still operating in T&T under long-term pre-2004 contracts. This means that it may take several years before any substantial changes are seen in the sector with regard to the labour force and import reduction. 4.1 How will Local Content Shape Investor-State Relations by 2020? The GORTT (2012) suggests that the initiatives imposed on the IOCs via the shift in terms and conditions in the 2012 Model PSC will contribute to a significantly higher percentage of skilled, local personnel employed within the energy sector of T&T by 2020. The MEEA (2013) has indicated that the intention of the LCP is not for IOCâ€™s to be solely responsible for the progress of the local labour force and development of the economy, but rather to improve the working relationship between the GORTT and the IOCs. Since the policy was implemented, the GORTT has embarked on several projects aimed at assisting the IOCs with a labour force comparable to international standards. One of these projects was the establishment of the University of Trinidad and Tobago (UTT) which aids in the education of nationals with regard to petroleum development and other useful energy related subjects. It is plausible that this assistance in providing an educated workforce will maintain and improve the status of the investor-state relationships by 2020. The IOCs may initially resist the local content requirements especially where they have pre-2004 contracts with the GORTT. It is suggested, however, that they will ultimately abide as they require the resources of T&T for income generation allowing a negotiation advantage which will ensure better treatment of the labour force (MEEA, 2013). Additionally, more countries are employing the use of local content policies, resulting in IOCs themselves highlighting plans for local content projects in the country during the bid round process. The adaptability of the IOC will also promote its standing in the country and compliance with the new PSC Model will allow them participate actively in future bid rounds held by the MEEA and GORTT. 4.2 Is There a Need for a Change in the Agreements? T&T already offers other forms of investor-state contracts, such as the concession, although in lesser quantities than the PSC. Based on the PSC developments in T&Tâ€™s 2012 Model, it appears that the GORTT and the MEEA are able to implement the requirements of the LCP effectively. This is clearly shown by the introduction of Article 39 in the 2012 Model which deals specifically and solely with local content and the investor. This means that there is currently no need for a shift in the main contract type used to govern investor-state relationships. The current PSC model successfully merges the requirement for an improved energy labour force and the incentives for foreign investors while not infringing on the sovereign right of IOCs. Considering that it has been less than a decade since the implementation of the LCP, it may be several years before the changes and benefits are observed in T&T on a large scale. Therefore, the introduction of a new contract type may actually dampen relationships with existing and potential investors. It is not recommended that T&T change its main method of petroleum contracts to comply with LCP initiatives as the current methods employed will potentially see an increase in the local labour force participation in the energy sector within the next decade. In the energy world, there a various types of investor-state contracts that govern the relationship between a host country and an IOC. T&T has been actively involved in oil and gas production for over a century, making them a substantial force in the Western Hemisphere. Since conception, IOCs have entered the country for E&P activities under a variety of agreements with the PSC being the most popular. The citizens of the country, however, were placed in a disadvantageous position as the IOCs brought their own employees and imported goods and services from international companies rather than local firms. To protect the residents, the GORTT introduced the LCP in 2004 that would govern the activities in the local energy sector. The true extent of this policy was seen via an examination of the terms and conditions of the PSCs between 2000 and 2012. This paper highlighted the fact that the LCP allowed an update of the PSC model that better reflects the objectives of the GORTT with regard to local content. While several IOCs are still under contracts that do not include these changes, the energy sector will observe future improvement in local participation as new contracts are awarded. 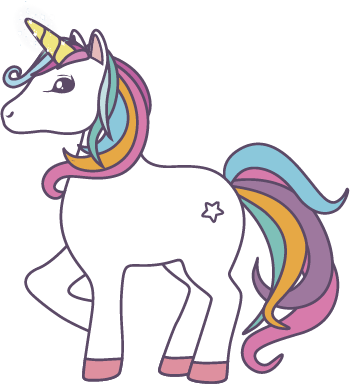 Based on the differences in the 2000 and 2012 Model PSCs, it is obvious that the GORTT have improved the terms and conditions to better reflect the implementation of the LCP. As a result of this, the recommendation is that T&T maintain its main form of investor-state contract as the new terms will eventually benefit the citizens of the country in the form of improved labour and marketability as new contracts are awarded. The state-owned oil company  Also referred to as concessionary agreements  Taxation and royalty policies as well as government expenditure to build capabilities  Promotion of Local Content, Local Participation and Local Capability Development  This is approximately 33,426 people employed in the energy sector in 2012 compared with 20,582 people in 2000. Figure 3 shows a 4.8% increase in entrepreneurial activity.